A brand new musical plays at The Other Palace, following the theatre’s initiative to provide a platform for work-in-progress musicals. The Little Beasts is a darkly imaginative piece packed full of magical, exciting puppetry fit to entertain any youngster. It follows recent staging’s of Heathers the Musical and circus-style extravaganza La Strada. Following a selfish little girl who runs away from home, The Little Beasts creates an enchanting menagerie filled to the brim with quirky animals. But there’s something different about these – they used to be children before their naughtiness brought the curse upon them! When the menagerie’s scary owner tasks her to choose an animal to set free, the little girl must learn if any of them have learned their lesson. In a world where everything is not as it seems, the show asks if any child is truly naughty? With puppetry, magic and mesmerising music by Luke Bateman, with lyrics and a book by Michael Conley, this new musical is guaranteed to thrill theatregoers of all ages. Casting includes Laura Baldwin as Sam and Sebastien Torkia as the Man in Black, as well as Oliver Evans, Nina Bell, Tyler Fagan and Seyi Omooba. Jamie Hinde directs the show, with musical direction by Brady Mould and puppetry direction by Nick Barnes. 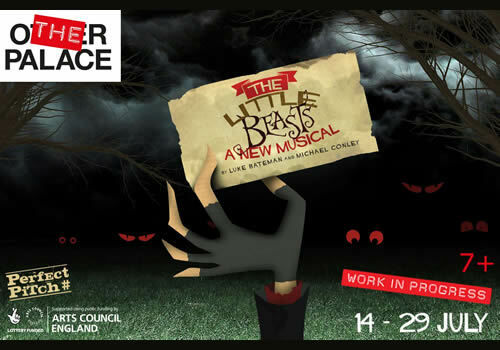 The Little Beasts is the charming work-in-progress musical that plays a limited season at The Other Palace, from July 14th to July 29th 2017. The Little Beasts is suitable for those aged 7 and up. Click here for the The Other Palace seating chart and seat price guide.